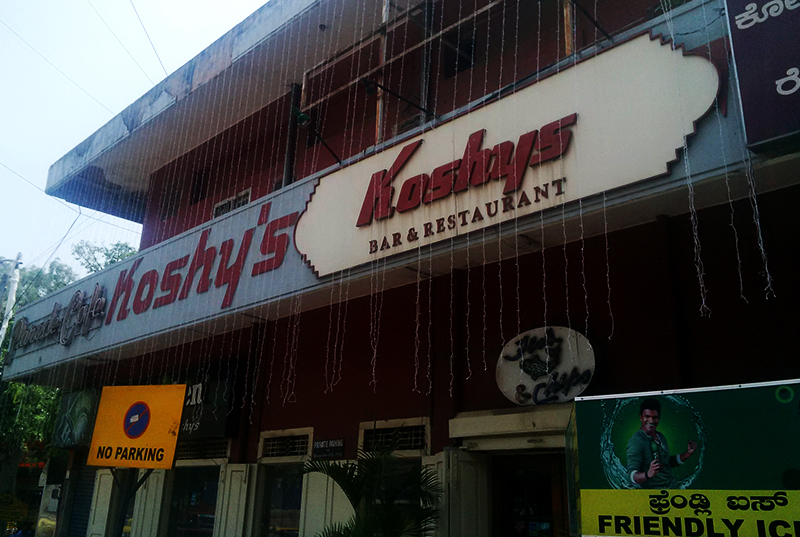 Koshy’s, Bangalore: What’s the fuss all about? I was on a one day visit to Bangalore the other day, and since my meeting wasn’t until later that evening, I had some time to kill. I decided to give Koshy’s a try. Koshy’s, if you haven’t heard of it, is an iconic cafe of sorts that has been running for more than 70 years. I had heard a lot about Koshy’s from various friends, acquaintances and of course the media. This was a place where the ‘creative types’ and intellectuals hung out, or so I’d heard, and a place you’d want to be seen at (The selfies on their Facebook fan page is probably testimony to this). 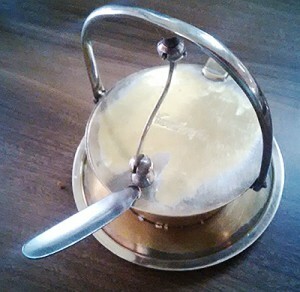 I wanted to find out first-hand what the fuss was all about, and so off I went to Koshy’s with a friend of mine. Located on St.Marks road, this calm pinkish-reddish-brownish building with its large name board looks its age, and presents a scene contrasting with the shiny new buildings and the hustle and bustle surrounding it. We walked in to the non-A.C’d part of the café (I think it is called the Parade Café, and the A.C’d one is called the ‘Jewel Box’ café). Coming in from broad daylight, my eyes took a while to get adjusted to the dimly lit insides. It was around 11 am, and so the place wasn’t crowded; Most of the tables were available, and we decided to take a corner table that provided the full view of the café. We settled into the sofa and whipped out our laptops so we could act busy. One of the waiters came over to take our order. Since I had already had my breakfast before making plans to come to Koshy’s, I decided to go light on my order. But just going through the menu made me hungry again. I ordered a mutton kheema stuffed omelette, a plate of buttered toast and a coffee while my friend ordered just coffee. We then sunk in to our sofa and started observing our surroundings. 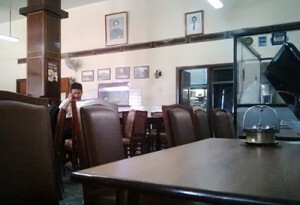 The interiors of Koshy’s resembles that of the old Indian Coffee Houses, if you have ever been to one. There are a few of those fans with giant bulbous centres rotating slowly, the tables and chairs look solid and old and on the walls are hung photos from earlier times. Across our table, a few elderly gentlemen were engaged in deep, animated discussions while waiters in white uniforms scurried around their tables filling their cups with coffee. Another table had a guy presenting something on his laptop to a suited gentleman; a pitch in progress, I supposed, given most of India’s youth is now ‘starting up’. Next to our table sat a fellow who looked like a politician (a deduction based on his clothing), studying the menu intently. My friend told me that there are people who come in here every day of their lives for a coffee. He also told me that this was one of the places where all kinds of people could let their hair down and relax over a cup of coffee without being judged. The waiter brought our order, and we dove in. The coffee was strong to the point of being bitter, which for me – for a guy who likes his coffee strong – was excellent. The stuffed omelette was bursting at its seams with kheema, and I found it lovely too. While we sat there sipping our coffee, we noticed that most of the tables were now occupied, and the noise level in the room was much higher. The breakfast menus had given way to lunch menus, and large platefuls of rice and curries were being transported by the waiters. Since I had heard that this was a place where you could sit for hours without the waiters hustling you, I did not have that nagging thought that I should either move out or order more stuff. Noticing our cups and plates empty, the waiter did check with us a couple of times if it was time to get our bill. We put up stiff resistance, and stayed around for another half hour or so before deciding to be nice and give away our table. Overall I found the food lovely, and the ambience calming. The price, I should say, is a bit steep – not a place I would go for my everyday breakfast. But not too high to keep me away for long as well. As for my original intention of finding out what the fuss was all about regarding Koshy’s, I think I got my answer. It’s part nostalgia, part identity, part comfort, part openness, part inspiration, part camaraderie and of course, part good food. What’s Koshy’s to you? I’d love to know. P.S: It’s only after I visited them that I heard their ‘Bowring kulfi’ is amazing. I’m going back for that. Koshys reminds me of Malgudi Days.. its so much like the coffee they serve pure ,uncomplicated , just right. You should try the Pot roast chicken there .. its yumm!